Are you under Pressure to Win Proposals and RFP’s? Is it your responsibility to respond to RFPs and Proposals within your organization? 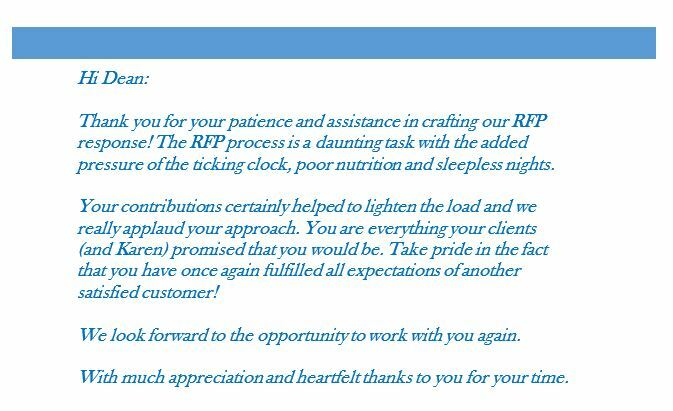 What strikes us about this thank you note, is how the challenge and priority of writing an important proposal response can be. It’s why we got into the business in the first place. Responding effectively in most proposal situations requires considerable thought and effort due to their sheer complexity. So, who is doing all of the proposal writing in your company? Generally, organizations have subject matter experts. And they have sales and marketing people. What many organizations lack is fabulous writers on staff and the time required to respond effectively to challenging RFP’s. What we here all the time is “I hate responding to RFP’s”, and “we never win”. Writing persuasively is a skill and an art. Responding effectively to complex proposals is an expertise. Have you considered outsourcing some of your writing requirements to help increase your chances of success? Also, by creating a proposal response Template that can be customized for future proposals, a professional writer can enable your team to send out the most compelling, professional and persuasive proposals – in a very efficient manner. The challenge that our client articulated above is the challenge that every company who’s business depends on winning proposals faces. Our expert team of writers ensure that your proposal responses are professionally done every time and in a very efficient manner.